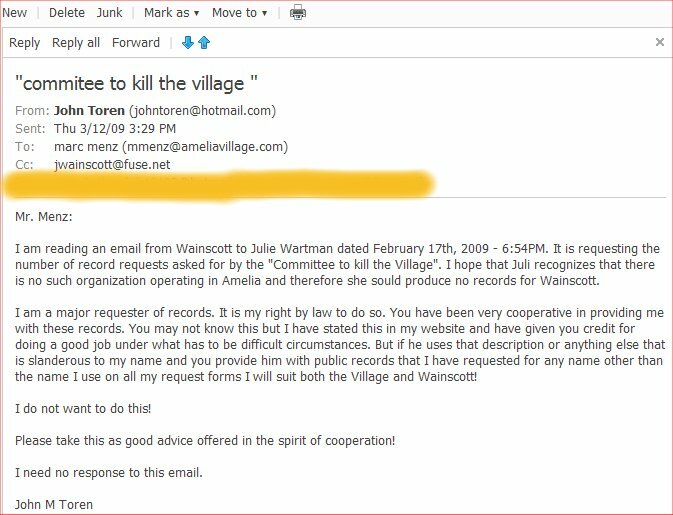 Wainsott Requests Public Records On The "committee to Kill the Village"! This guy is starting to go to far. He uses the word kill so frequently it seems like an obsession! I have taken this up with Police Chief Sucher, (click here to read) in great detail when I dicovered he asked the Chief if it was ok to point a gun at someone! You really need to read that article"
Now he is asking the Village to provide him with information using the slanderous name of "committee to Kill the Village". The email is next up, Read it for yourself, Wainscott's on the bottom, the Village response is at the top! Wainscott can call me anything he likes to my face and I wouldn't care one bit. But there is an implication here that I am part of his kill organization since I am probably at the top of the list for requesting public records. I have spent a lot of money and a lot of time doing analysis of these records for your benefit. It is one of the reasons I have so many articles and have uncovered so many lies and deceptions such as how Menz got his job. Click here and read that one and I think you will agree that it was worth the effort so that Amelians could see what kind of people live at 44 W Main! 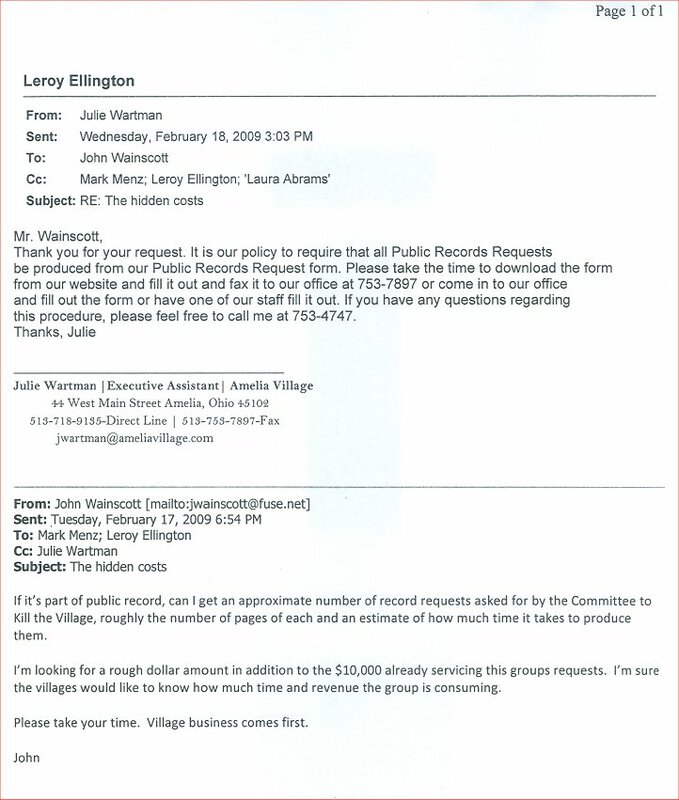 What I have done is put yet another Public Records request in for any and all Public Records referencing the "committee to Kill the Village". Should they have assumed that I was one of the "committee to Kill the Village" members and they indeed have given him my records I will be seeking to take them to court with a slander law suit. I will also suggest that anyone else whose records were given to Wainscott join me in a class action suit to remedy this situation. In fairness to the Administration I set an email warning to Menz with a Cc to Wainscott. Read it for yourselves, it's up next. I don't know what else to say except I am not a member of any organization in Amelia and I certainly would not join an organiztion that wants to kill Amelia or anything else for that matter. Help us dissolve Amelia please. Amelia will still be here, it's not going anywhere but at least we will not have to put up with Wainscott's slanderous commentary any more!